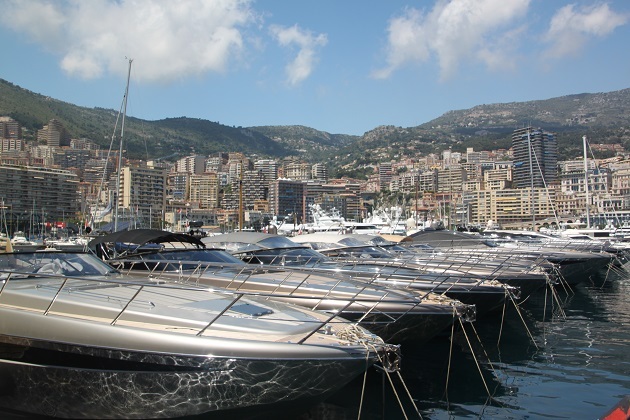 Monaco is flashy, glitzy and rich that is for sure. No place is that more evident than in the port where there are endless ocean going vessels of all shapes and sizes. Strolling around a harbour or port on holidays is the norm for us, none of those past strolls was anything quite like this. Hemmed in by France on three sides and the sea on the fourth, this place has the greatest number of billionaires per capita in the world and the Monagesques do not pay taxes. Serious numbers under any circumstances but more so when you consider this is the world’s second smallest country (only the Vatican is smaller) and is about the size of London’s Hyde Park. Loads of celebrity exiles including Rafael Nadal and Lewis Hamilton call Monaco home. 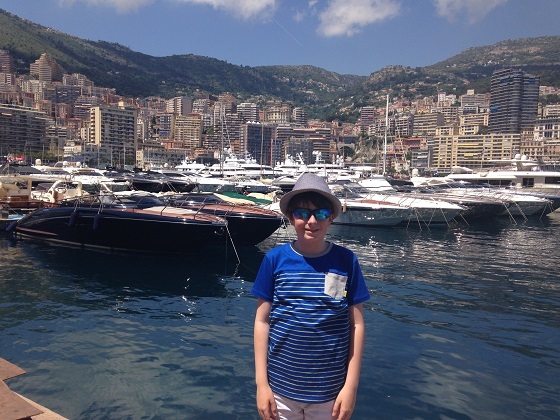 We wandered around the harbour, took in those luxurious yachts and a few cruise ships – Son picked out his favourites, not an easy task. 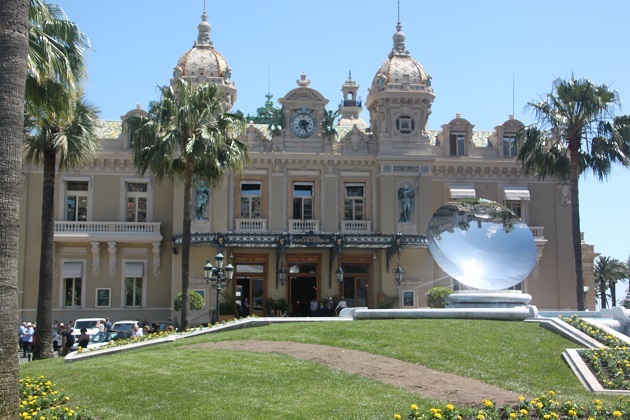 We knew that Monte Carlo was a steep walk up from the port but wanted to explore this part and check out the casino, gardens and deluxe hotels. We resigned ourselves to an uphill hike but then followed a big tourist group who seemed like they knew where they were going. They did. Walking through a tunnel they veered off to a side area, not too obvious unless you were in the know, but it housed a lift to the casino terrace. A real short cut and for us a very lucky find. We emerged and only had to climb about twenty steps – a welcome discovery on an incredibly hot and sticky day. 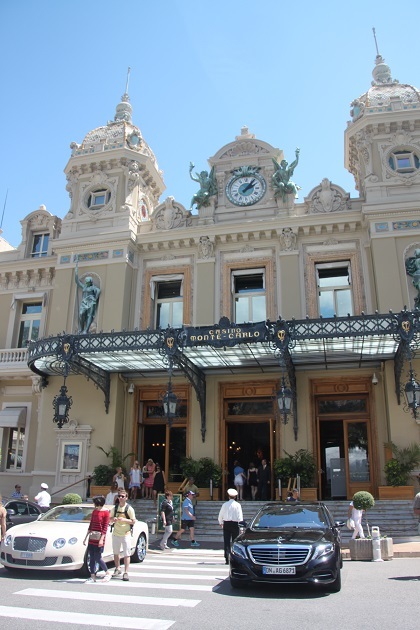 The casino sits on a terrace – I read this is one of the grandest views along the entire Riviera. Richard Burton presented Elizabeth Taylor with the Kohinoor diamond at this very spot. I found it all a bit frenzied, lots of traffic and hustle and bustle, not quite as scenic as I had hoped or remembered. A quick peek in the casino for us – we weren’t very interested to go inside but just wanted to check out the hallway. Son wouldn’t have been allowed in but casinos are not our thing anyway. Apparently you need your passport to enter – the locals are prohibited from gambling. You can visit without gambling but I read you still have to pay a nominal fee. 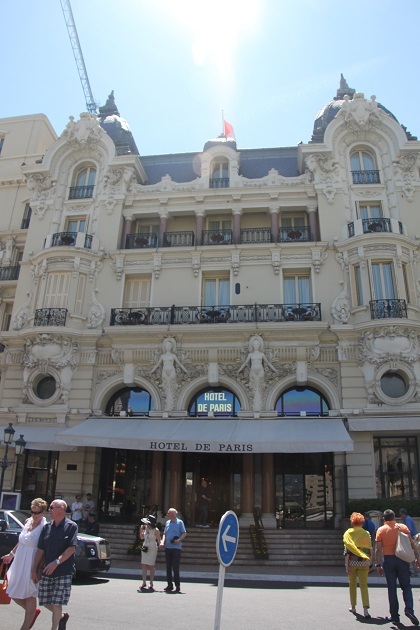 No end of chauffeur driven Rolls Royces dropping people off at the door of the casino and the lobby of the Hotel de Paris just across the square. Apparently it is traditional to rub the left knee of the bronze statue of Louis XIV’s horse there for good luck before a casino visit. Ice creams were the order of the day after all this. Son spied an establishment selling these much desired items, we cooled down and made our way back to the train, exhausted after a great day out in Monaco. 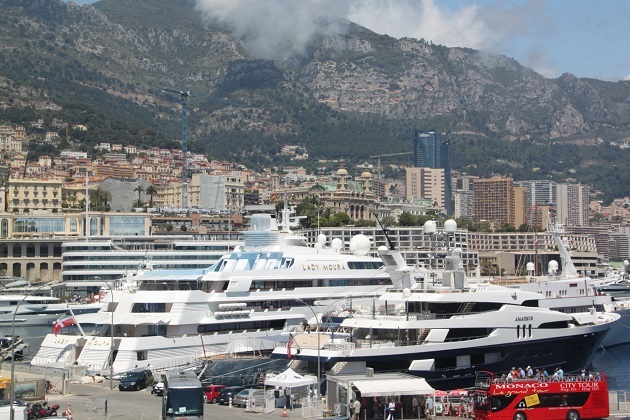 There is something very special about Monaco, great photos of the yachts! It really is a special and different kind of place for sure. 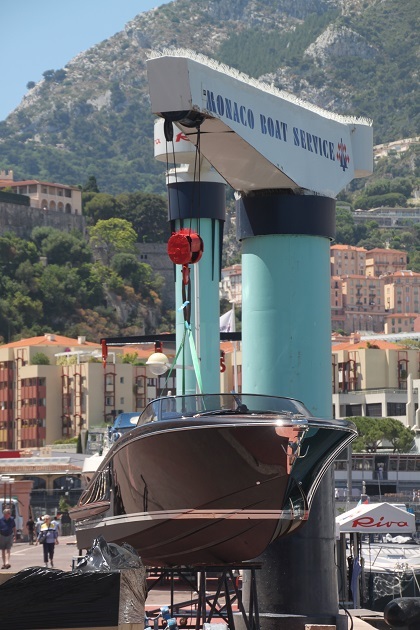 The yachts – never seen anything quite like them!! 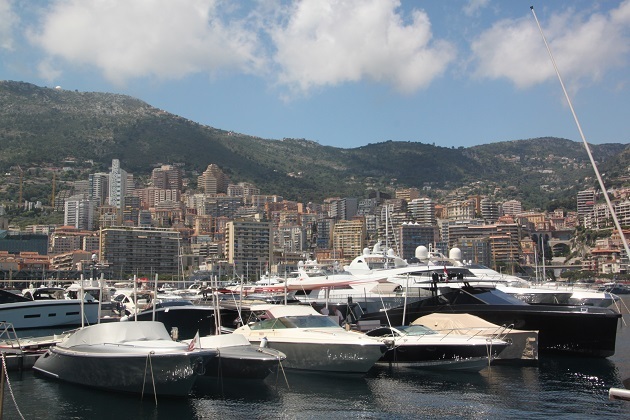 Monaco is quite beautiful, I had a great experience when I travelled there last year. It is literally something out of the movies. Amazing post and great pictures. Thanks Cathy – we enjoyed our day out there for sure too! 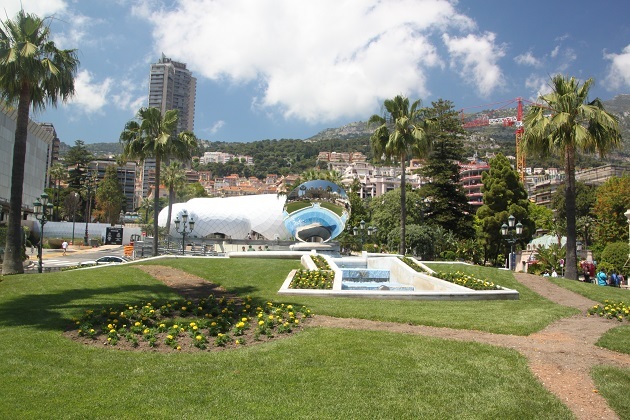 Despite its tiny size there’s so much to see in Monaco – it was fun to take your stroll around and admire your photos! My husband and I had been there years ago and it was fun for us to go back and retrace our steps with our son. Great to see your photos. We’re flying into the south of France later this month for a river cruise and I was somewhat disappointed not to have time to see Monaco. Your photos will have to suffice. There are so many other wonderful places to see though – difficult to fit everything in! We enjoyed our day out there, I have always been a fan of Grace Kelly so was interested to explore that connection and see her grave in the cathedral. I do get what you mean though, I’m glad we only had a day trip here and didn’t stay. The hill villages were what really stole my heart! Looks fabulous but I think I prefer to live in Grimsby! Totally get that!! A day was quite enough for us, we loved exploring but no way would I be tempted to live there – not that I could afford it anyway! I would have to complain about all that noise at Grand Prix weekend! Beautiful city! 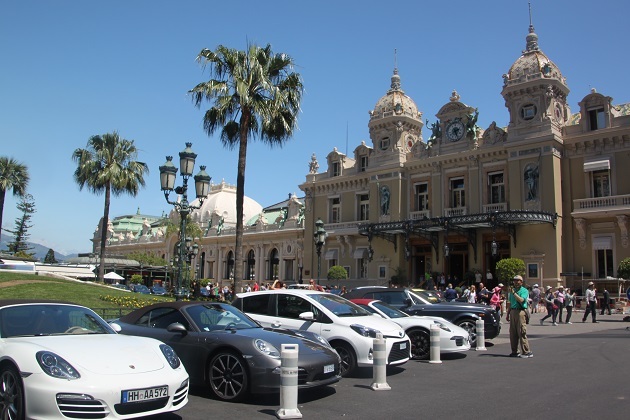 Monte Carlo is on my bucket list…all the glitz and glamour is irresistible! Thanks for sharing. It is definitely full of glitz – a fun place to visit. I’ve always wanted to go to Monaco. This definitely piques my interest more. It’s full of interesting things to see and do plus all those dramatic views – definitely recommend! Glad to hear Son has picked out his yachts. Time to start saving the pocket money! Hmmm, he’s not so good at that!! Maybe a lottery ticket! Very different casino experience than we have here in the states. Very interesting. I’ve never actually been in a casino anywhere George, don’t think I’d know what to do!! I would definitely need to rub the horse if I went in here! The tour bus looks so small next to the yacht. Been there several times, the town is too packed for me, but love the casino area and the port too. We loved the port and also the walk from the cathedral down – I know what you mean about the town, I felt exactly the same way! Joy, I have been there and your photos brought it back in my mind! I was so surprised that the casino wasn’t that large, in comparison to the Las Vegas ones which are part of huge hotels . The day we were there it wasn’t so crowded! Thanks for the visit once again! Las Vegas is another of those places I would just love to visit Pam – would have no idea what to do in a casino but just to experience all that goes on there and see it for myself! I guess this place must be totally different! We tried to fit in as much as we possibly could Rosemary, it was an exhausting but productive day, I snoozed on the train the whole way back!! I would like to go there! 🙂 Nice photos. Thank you! It is a beautiful place – highly recommended! Thank you for dropping by here too and commenting!